The work, called Edinburgh Lectures on Mental Science, begins with a chapter on spirit and matter, and shows that the fundamental principal of everything is the spirit, the ideal, the purpose and object and matter is simply the form in which this spirit manifests itself. A living spirit, and dynamic force are the central power, and active moving matter is the result. There is no such thing as dead matter, through all the universe, there is motion, continuous, that is guided by a spirit, an ideal power towards Ideal ends. A second chapter describes the control over these spirit forces by higher intelligence and shows that there is a certain atomic as well as psychical intelligence which governs the world in every detail. After describing the unity of the spirit forces, showing that they are under great laws that regulate their activity, he takes up the subjective and objective minds or the conscious or the subconscious activities of the brain and points out their relation and association, and how far they dominate and influence the details of life. The chapters on the laws of growth and receptivity, showing that universal mind and individual mind are exact results, and not random changing efforts. Also it is possible to trace them to their causes. In the next chapter intuitions and their indications and meanings and the law which control them, are shown to be realities. By Thomas Davison Crothers, M.D., 1842 – 1918. The Medico-Legal Society has always taken note of the advanced work done in the various fields of science that had a medico-legal interest. During the last quarter of a century there has been very startling changes and revolutions in the old theories of the physiology and psychology of brain activities. Prof. James of this country, and other very able men abroad, have led in the discovery of new fields of mental philosophy, and have shown some of their practical relations, which literally made whole libraries of discussions on mental philosophy, obsolete and useless. A great many writers have rushed into this new field with new theories and new conclusions, described in the most minute manner and marked out boundary lines and limits of brain power and force. The mystical and unexplainable has been described freely, but the very minuteness of the explanations has roused suspicion. The advent of Christian Science is literally a great cosmic wave of expectant thought and studies, seeking to determine the phenomena of life, from another point of view. The popularity of this movement and its development into a church system, with all the essentials of an established faith, with the most exact studies of relations of life health, and death, are almost significant signs of prematureness, early death and evolution out into something wider and more substantial. It is really the first stage of the settlement of a new country, and its adherents and advocates are the squatter settlers, buoyed over with enthusiasm and extravagant expectations and positiveness of the future and the tremendous possibilities of the present. They are building great cities, promising great wealth to all their adherents, but by and by they move on and disappear, and the actual settlers come on, take up the real facts, cultivate them and finally they become contributions to the great eternal march of progress. A number of independent writers following and co-temporary with Prof. James have made strong contributions in this field, probably Prof. Dressier of Cambridge and Ralph Waldo Trine of the same place and others have had the largest number of readers of their various books. 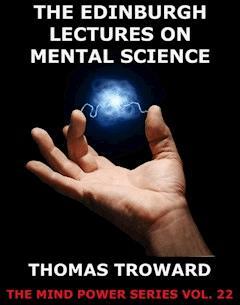 A few years ago a Scotch Judge living at Edinburgh by the name of ThomasTroward, who had been many years on the Bench of India,and who is still in service in Scotland, gave a course of lectures at Edinburgh on Mental Science. These were repeated in London and in other towns in England, and were published in small volumes. Curiously enough, they were presented in a very quiet and unobtrusive way, and apparently did not attract much attention at the time and yet now they are accepted as the most important studies of mental science and the newer psychology that have been made. The sale of these books has been increasing slowly and steadily, and everywhere they are creating most startling impressions in the nature of a revelation and certainly along an evolutionary line, beyond anything seen in this field of mental philosophy. The first series called Edinburgh Lectures on Mental Science was delivered nearly ten years ago. The second work called Dore's lectures on Mental Science, was delivered in London a few years later, and the third book called Creative Processes in the Individual, was delivered recently. All these comprised a continuous study, more or less elaborate and specialized from one to the other. Within the last year, the author has issued another book, called Bible mystery and Bible Meanings, a more elaborate effort to make practical the new conceptions of mental science in the study of the Bible and Bible heroes. These four books give a very clear idea of the most advanced studies in psychology, concerning the mind, the brain and the body, and its influence and power. The author has evidently opened up a new range of study higher up, and shown how the new discoveries of science and thought have put the dynamic forces of modern civilization into new service unknown before. To the scientific reader there is a very unusually clear cut, graphic form of statement, and practical application of facts that is not only new but most attractive in its clearness and directness, also there is a judicial cast of thought, in which the evidence is sifted, concentrated and grouped in the strongest way, and the facts on which they are based, are outlined and described. This contrasts so sharply with the usual mystical voluminous, dogmatic writers, who assume a certain certainty and positiveness of statement, and then proceed to conclusions that are suspicious from the very emphasis that is put upon them. The reader is conscious that he is listening to a master teacher, who is not only a reader of science, but is student of facts and their meaning and is abundantly able to determine the real from the false and the probable from the assumptions, and that he stating conclusions and the basis on which they are founded, with a judicial clearness that has not been seen in this field before. The first work, called Edinburgh Lectures on Mental Science, begins with a chapter on spirit and matter, and shows that the fundamental principal of everything is the spirit, the ideal, the purpose and object and matter is simply the form in which this spirit manifests itself. A living spirit, and dynamic force are the central power, and active moving matter is the result. There is no such thing as dead matter, through all the universe, there is motion, continuous, that is guided by a spirit, an ideal power towards Ideal ends. A second chapter describes the control over these spirit forces by higher intelligence and shows that there is a certain atomic as well as psychical intelligence which governs the world in every detail. After describing the unity of the spirit forces, showing that they are under great laws that regulate their activity, he takes up the subjective and objective minds or the conscious or the subconscious activities of the brain and points out their relation and association, and how far they dominate and influence the details of life. The chapters on the laws of growth and receptivity, showing that universal mind and individual mind are exact results, and not random changing efforts. Also it is possible to trace them to their causes. In the next chapter intuitions and their indications and meanings and the law which control them, are shown to be realities. The discussion of the will is so graphic and new and intensely practical, that one thinks of the whole library of books discussing it in the past as literally useless. The chapters on the sub-conscious mind and its powers on the body as a whole, and the evidences which support these various terms are all treated with a Judicial conservatism and clearness, and the unverifiable theories and conclusions, are contrasted with them. The second book called Dore's Lectures on Mental Science, continue the subject in greater detail. The central fact, brought out with great clearness is the universal originating spirit, moving with absolute exactness and perfection, and that the individual must express this in his life; that it is within his power to reach out, and get in touch with these great underlying powers and be carried on to success and development, beyond anything at present conceived of. IN commencing a course of lectures on Mental Science, it is somewhat difficult for the lecturer to fix upon the best method of opening the subject. It can be approached from many sides, each with some peculiar advantage of its own; but, after careful deliberation, it appears to me that, for the purpose of the present course, no better starting-point could be selected than the relation between Spirit and Matter. I select this starting-point because the distinction—or what we believe to be such—between them is one with which we are so familiar that I can safely assume its recognition by everybody; and I may, therefore, at once state this distinction by using the adjectives which we habitually apply as expressing the natural opposition between the two— living spirit and dead matter. These terms express our current impression of the opposition between spirit and matter with sufficient accuracy, and considered only from the point of view of outward appearances this impression is no doubt correct. The general consensus of mankind is right in trusting the evidence of our senses, and any system which tells us that we are not to do so will never obtain a permanent footing in a sane and healthy community. There is nothing wrong in the evidence conveyed to a healthy mind by the senses of a healthy body, but the point where error creeps in is when we come to judge of the meaning of this testimony. We are accustomed to judge only by external appearances and by certain limited significances which we attach to words; but when we begin to enquire into the real meaning of our words and to analyse the causes which give rise to the appearances, we find our old notions gradually falling off from us, until at last we wake up to the fact that we are living in an entirely different world to that we formerly recognized. The old limited mode of thought has imperceptibly slipped away, and we discover that we have stepped out into a new order of things where all is liberty and life. This is the work of an enlightened intelligence resulting from persistent determination to discover what truth really is irrespective of any preconceived notions from whatever source derived, the determination to think honestly for ourselves instead of endeavouring to get our thinking done for us. Let us then commence by enquiring what we rea1ly mean by the livingness which we attribute to spirit and the deadness which we attribute to matter. At first we may be disposed to say that livingness consists in the power of motion and deadness in its absence; but a little enquiry into the most recent researches of science will soon show us that this distinction does not go deep enough. It is now one of the fully-established facts of physical science that no atom of what we call "dead matter" is without motion. On the table before me lies a solid lump of steel, but in the light of up-to-date science I know that the atoms of that seemingly inert mass are vibrating with the most intense energy, continually dashing hither and thither, impinging upon and rebounding from one another, or circling round like miniature solar systems, with a ceaseless rapidity whose complex activity is enough to bewilder the imagination. The mass, as a mass, may lie inert upon the table; but so far from being destitute of the element of motion it is the abode of the nevertiring energy moving the particles with a swiftness to which the speed of an express train is as nothing. It is, therefore, not the mere fact of motion that is at the root of the distinction which we draw instinctively between spirit and matter; we must go deeper than that. The solution of the problem will never be found by comparing Life with what we call deadness, and the reason for this will become apparent later on; but the true key is to be found by comparing one degree of livingness with another. There is, of course, one sense in which the quality of livingness does not admit of degrees; but there is another sense in which it is entirely a question of degree. We have no doubt as to the livingness of a plant, but we realize that it is something very different from the livingness of an animal. Again, what average boy would not prefer a fox-terrier to a goldfish for a pet? Or, again, why is it that the boy himself is an advance upon the dog? The plant, the fish, the dog, and the boy are all equally alive; but there is a difference in the quality of their livingness about which no one can have any doubt, and no one would hesitate to say that this difference is in the degree of intelligence. In whatever way we turn the subject we shall always find that what we call the "livingness" of any individual life is ultimately measured by its intelligence. It is the possession of greater intelligence that places the animal higher in the scale of being than the plant, the man higher than the animal, the intellectual man higher than the savage. The increased intelligence calls into activity modes of motion of a higher order corresponding to itself. The higher the intelligence, the more completely the mode of motion is under its control; and as we descend in the scale of intelligence. the descent is marked by a corresponding increase in automatic motion not subject to the control of a self-conscious intelligence. This descent is gradual from the expanded self-recognition of the highest human personality to that lowest order of visible forms which we speak of as "things," and from which self-recognition is entirely absent. Form implies extension in space and also limitation within certain boundaries. Thought implies neither. When, therefore, we think of Life as existing in any particular form we associate it with the idea of extension in space, so that an elephant may be said to consist of a vastly larger amount of living substance than a mouse. But if we think of Life as the fact of livingness we do not associate it with any idea of extension, and we at once realize that the mouse is quite as much alive as the elephant, notwithstanding the difference in size. The important point of this distinction is that if we can conceive of anything as entirely devoid of the element of extension in space, it must be present in its entire totality anywhere and everywhere—that is to say, at every point of space simultaneously. The scientific definition of time is that it is the period occupied by a body in passing from one given point in space to another, and, therefore, according to this definition, when there is no space there can be no time; and hence that conception of spirit which realizes it as devoid of the element of space must realize it as being devoid of the element of time also; and we therefore find that the conception of spirit as pure Thought, and not as concrete Form, is the conception of it as subsisting perfectly independently of the elements of time and space. From this it follows that if the idea of anything is conceived as existing on this level it can only represent that thing as being actually present here and now. In this view of things nothing can be remote from us either in time or space: either the idea is entirely dissipated or it exists as an actual present entity, and not as something that shall be in the future, for where there is no sequence in time there can be no future. Similarly where there is no space there can be no conception of anything as being at a distance from us. When the elements of time and space are eliminated all our ideas of things must necessarily be as subsisting in a universal here and an everlasting now. This is, no doubt, a highly abstract conception, but I would ask the student to endeavour to grasp it thoroughly, since it is of vital importance in the practical application of Mental Science, as will appear further on. The opposite conception is that of things expressing themselves through conditions of time and space and thus establishing a variety of relations to other things, as of bulk, distance, and direction, or of sequence in time. These two conceptions are respectively the conception of the abstract and the concrete, of the unconditioned and the conditioned, of the absolute and the relative. They are not opposed to each other in the sense of incompatibility, but are each the complement of the other, and the only reality is in the combination of the two. The error of the extreme idealist is in endeavouring to realize the absolute without the relative, and the error of the extreme materialist is in endeavouring to realize the relative without the absolute. On the one side the mistake is in trying to realize an inside without an outside, and on the other in trying to realize an outside without an inside; both are necessary to the formation of a substantial entity.